This mini-festival was started as a snarky jab at the better known, similarly accronymed event but has taken on a life of its own and is now in its sixth year. This year "The Other ACL" has two free nights with the first sporting Mike Watt & His Missingmen and Hamell on Trial as co-headliners. You can attend all four nights for only $15, be just about as close as you want to the stage, and not have to wade through throngs of glo-sticks and patchouli’ed “festival trash” while enjoying reasonably priced drinks and indoor plumbing and also supporting LOCAL independent businesses that support LOCAL music year round. From ACL founder/organizer Jeff Smith, "I am not in the concert promotion business and have no sponsors for this event and have little backup other than what I receive from the Hickoids and a few friends. I believe that the only thing that should be on the stage is the artist and whatever and whoever they choose to bring with them. If you feel the same way - please support." The Gatsby 708 E. 6th St. 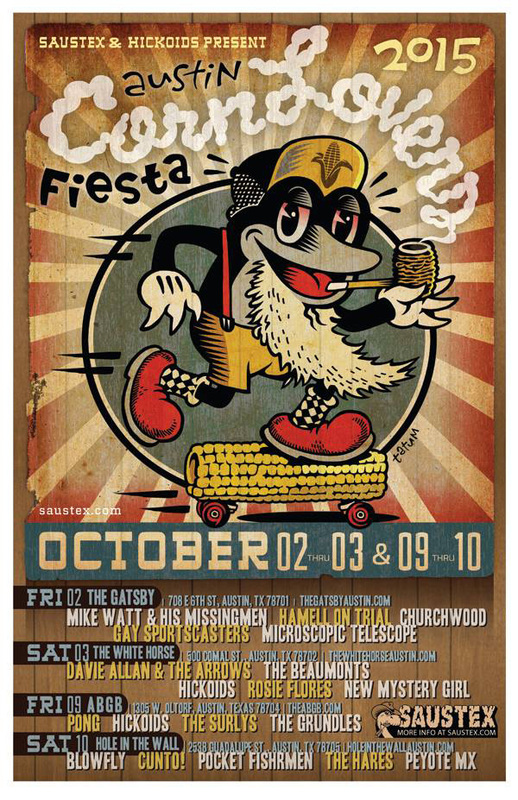 Sat 10/10 Hole In The Wall (Austin, TX) Cunto!